Seventeen New Zealand coastwatchers and five civilians captured in the Gilbert Islands (now Kiribati) during the Second World War were beheaded at Betio, Tarawa. Coastwatchers – service and civilian personnel who kept a 24-hour watch for enemy ships and aircraft – were a vital link in the intelligence chain during the Pacific War. For most, the main challenges were isolation and boredom. For those on the front line in the Gilbert Islands, however, the risk of capture by the Japanese was very real. During August and September 1942, 17 military coastwatchers (seven Post and Telegraph Department radio operators and 10 soldiers), and five civilians were captured as Japanese forces overran the Gilbert Islands. 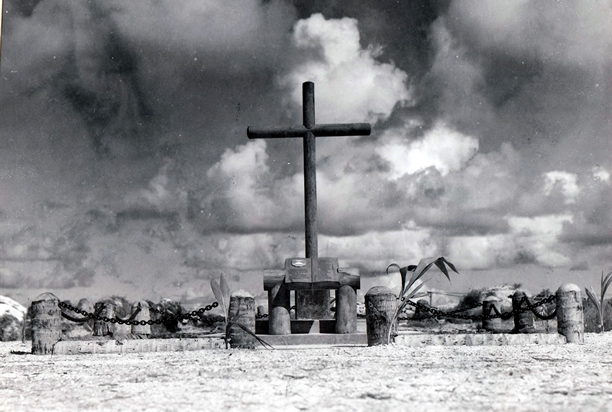 Imprisoned on Tarawa atoll, they were all beheaded following an American air raid on the island. All those executed received a posthumous mention in despatches. The civilian coastwatchers were retrospectively given military rank in 1944 so that their dependants could claim pensions and other rights. We have 9 biographies, 17 articles, 10 comments related to New Zealand coastwatchers executed by the Japanese. Why is there no listing of those men killed and wounded board HMNZS Leander at the Battle of Kolonbangara on 13 July 1943, including my father Stoker Petty Officer William Henry Guest NZD949. My grandfather was Colin Stanley Davis a coast watcher I don't have much information. About his service as his diary were destroyed. I have been researching this event for the benefit of family members of Ray Ellis, one of the coastwachers killed at Tarawa and would much appreciate it if I could be put in contact with Paul Canham who has posted a message here about material he has available for research. I am happy to have my email address forwarded to him. I have a lot of original, unpublished material on the New Zealand coastwatchers. This was compiled and held by David Shepherd, who was based at Suva Aeradio (BVO) which was the radio link with the coastwatchers. I will be happy to make it available to any genuine researcher. The comment that "He was hunted down and shot by armed Korean labourers" cannot be correct as Korean labourers were not landed on the island until December, some months after the atrocity. There is no doubt that the escapee was hunted down and somehow killed, most likely by a staff officer of the Japanese occupying forces.